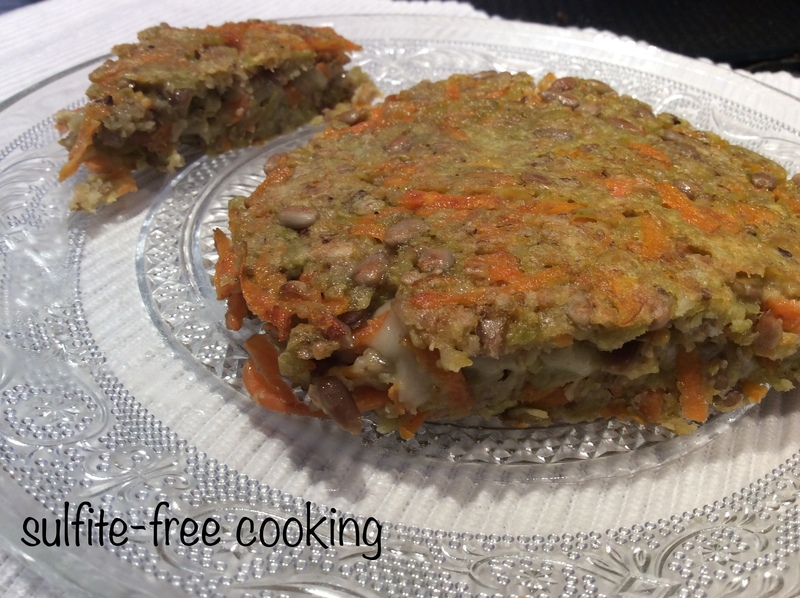 versatile, easy-to-make patties in three versions… and my true nature revealed! We are having a heat wave here in France. I hate it when it gets hot so early in summer! Mind you, I shouldn’t complain: although we don’t have air conditioning, up until now it hasn’t been too bad. Our thick wooden shutters, when closed, manage to keep most of the heat out. I also keep cooking to a minimum. Dear neighbors, this post is just about this: a recipe, which comes in three options (plain vegetarian, cheese-filled*, and meat-filled) and that requires very little cooking. Now, if you hesitate to take this very special treat from your pet, relax: I have an easy, no-cooking substitution for you! *funny, but lately I have had cravings for cheese: is it merely psychological or could it be a special request from my mending bone? 1. Mash garbanzo beans if using. Mix flakes and salt with fork and add warm water. Set aside. 2. Beat egg and coarsely grate carrot. Mix and season with cumin, to taste. Quickly toast sunflower seeds in non-stick pan. They should turn slightly golden. 4. Cooking for plain patties: using a small ladle, drop 4 heaps of batter onto a hot oiled non-stick pan. Smooth with back of a spoon into 1 cm thick (½ inch) patties and cook until slightly golden on each side. Cooking for filled patties: drop a good half of the batter into 2 heaps. Shape and smooth as best as you can into round patties. Place cheese slices or meat onto each pattie, cover with the remainder of the batter and cook until slightly golden on each side. Tell me, dear neighbor, which version tickles your fancy ? I love the one with the melted cheese inside. If you can see it, say “cheese” for the photo! Hi Joelle. Do you think grinding split peas/red lentils into a flour might work? I am guessing that the flakes are used because they absorb water more quickly and cook through much speedier than the whole peas. The recipe sounds perfect – I love oats! Hi Kathryn! I am not sure that this would work, because after researching it a bit I learned that these are made from precooked peas, which are then flaked in a process similar to oat flaking Your best bet is to cook the dried split peas in little water: too much liquid would not work well here. Whichever method you try, let me know how it turns out. I wonder if quinoa flakes might work instead of split pea flakes. I’ll experiment – thank you, Joelle! Oh you are so smart! I’ll let you know, of course. I’ve never heard of split pea flakes, though I can relate to your troubles. When using carob I often found delicious recipes…for dogs, one of which became an faux-oreo recipe. I’m in the same boat dear neighbour, I’ve had little time for new creations and have instead been in the garden watering everything at least once a day, but everything is green and healthy, I even have a few tomatoes starting, Maybe they’ll survive without splitting like every other year. I hope you arm is healing up and that you’re being taken care of, sadly this neighbour lives across the ocean or he’d be happy to help in the garden. It’s obvious you need no help in the kitchen. The patties look delicious. Take care. Another hot day starting… I’ve just left a small container of water outside for the birds. Last night, as the night before, my husband had to water the beans (pretty sure we’ll have the first ones next week), potatoes and flowers, in addition to grating the carrot and flipping the patties for me! He is taking time off starting today so he will give the squash another go, even though it is a little late in the season. You too, take care. Your freezer must be well stocked by now. I can’t wait to see how you’ll use all that fresh produce. It’s being emptied and restocked simultaneously. I’m eating my way through the old hospital stock and restocking for the new time, albeit slower, I only had a week last time, now I can take my time. I’m also planning on have a wheelbarrow placed near the plants that I can fill with a hose, then I can water with a small jug after the surgery. I’ll be safe, smart and, as always, stubborn! My squash need me after all.